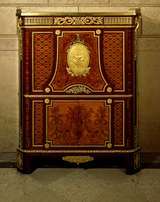 A brand mark on the back reveals that this secretaire and its matching commode (now in the Frick Collection, New York) were made for Queen Marie-Antoinette of France. They form part of a series of items with similar trellis and floral marquetry that were produced for the Queen's apartments at Versailles, Marly and other palaces during the early 1780s, and seem to date - on stylistic grounds and the presence of the mark of the 'Garde-Meuble de la Reine' (introduced in 1784) - to 1783-5. The maker, Jean-Henri Riesener, remodelled the secretaire and commode in 1790-1. Empty bolt- and nail-holes reveal that they were originally fitted with lavish mounts identical to those on the spectacular black lacquer secretaire and commode (now in the Metropolitan Museum) which were made for Marie-Antoinette in 1783. The Frick secretaire and commode were altered to give them a trimmer, less weighty appearance. This involved lowering and widening the friezes and making the forecorners less pronounced. Bracket feet were added to the secretaire and the feet on the commode were shaved down and lengthened. Riesener retained some of the old mounts, including the oval plaques on the fronts, but replaced many others. He finished the alterations by signing his name and the date - 1790 on the secretaire and 1791 on the commode - at the bottom of the marquetry, at the base of the pieces. It seems likely that the secretaire and commode were remodelled for the Queen's apartments at the Tuileries. The royal family had been forced to take up residence at the palace during the first few months of the Revolution in 1789 and they remained there - except for a summer spent at Saint-Cloud in 1790 - until six weeks before the abolition of the monarchy on 21 September 1792. During this period, the Queen is known to have redecorated her apartments and changed her furniture.